What a tasty debut!! Eve and her Nonna don’t agree with what’s on and not on the menu but she knows her grandmother didn’t kill anyone. Eve pulls her friends and family together to do whatever they have to so she is cleared of the crime and back at the restaurant where she belongs. Even if it means breaking and entering! When you pick up this book be prepared to laugh and laugh a lot. This is a true group of quirky characters and I was surprised at their depth for this being the first book in the series. This is a big Italian family so there are many characters to keep straight but as the story progresses they each come into their own and are very easily pictured in the reader’s mind. Don’t be scared off by the hard to pronounce or long Italian names, soon you will feel right at home at Miracolo’s. 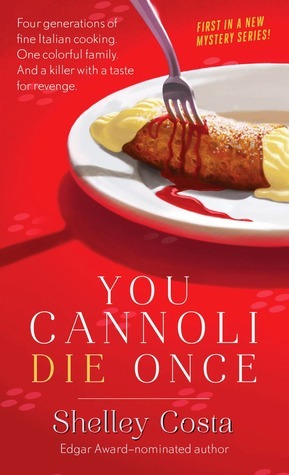 The story unfolds slowly with delectable dialogue, a few bites of tongue in cheek moments, some crumbs of sarcasm, and references of some great operas. Then it picks up steam as the clues start to come together. There is also a little romantic tension we all love too. All together a yummy cozy mystery. I can hardly wait for my next reservation at this wonderful Italian eatery. Find out more about Shelley Costa on her webpage here. I would love to share my review copy with one lucky winner!! As usual another great book and I so love to laugh.!!! Thanks again for sharing. I am excited to start this series. Sounds good. Thank you for your review. Sounds like a really great book. Sounds like a great read and the picture looks yummy! I LOVE foodie, mystery books! Can’t wait to read this. I can’t wait to try this one. I could use a funny book! Sounds like a read I will love. Now I can’t wait to get my hands on my copy. This does sound like a very good one! Can’t wait to read it. I also don’t think I’d order ‘murder’ for my meal either. But I love to read about murder, and the antics that our heroine and her friends and family must go through to solve it. I will have to check out this series! Oooh! This one sounds GREAT! I would LOVE to win and read it! Thanks! Just found your site and cannot wait to read all of your reviews.